Epidemiological studies have shown a relationship between low concentrations of high density lipoprotein (HDL) cholesterol and the incidence risk of cardiovascular diseases1,2. 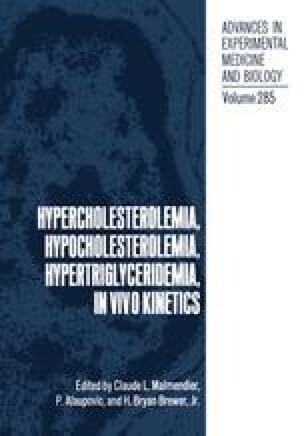 Recent pharmacological studies3 have clearly demonstrated the protective role of HDL and their involvment in reverse cholesterol transport in vivo 4,5. In that respect apo E-free HDL has been long known to bind to a variety of cells and to promote cholesterol efflux6. Among peripheral tissues, adipose tissue is recognized both in man and rodents for its ability to accumulate, store and, when needed, mobilize a large pool of unesterified cholesterol7,8. Thus adipose cells represent a cell type suitable to study the first step in reverse cholesterol transport, i.e. cholesterol efflux. Unfortunately adipocytes isolated from adipose tissue loose their viability within a few hours, preventing the analysis of middle-term and long-term responses. During the last decade have been established in our laboratory preadipocyte cell lines from adipose tissue of genetically obese ob/ob mice9 and their lean counterpart10. The validity of these cellular models is supported by i) the biochemical properties of differentiated cells which are similar, if not identical, to those of adipocytes isolated from fat tissue and ii) the ability of undifferentiated cells to differentiate in vivo within a few weeks into fully mature fat cells after their injection into athymic mice, under conditions where these cells could be unambiguously demonstrated not to be fat cells originating from the host animal11.